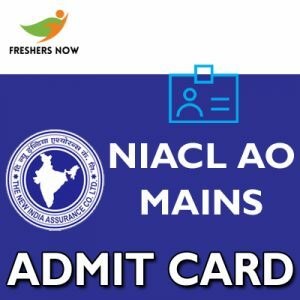 NIACL AO Interview Call Letter 2019 Released… Good News for the aspirants waiting for the NIACL AO Interview Hall Ticket 2019. That the officials of the New India Assurance Company Ltd (NIACL) had released the NIACL AO Interview Call Letter 2019 on their official portal @ 28th March 2019. So, candidates who are eligible to attend the NIACL AO Interview 2019 need to attend on the scheduled date. Furthermore, the NIACL AO Interview Date 2019 is scheduled from 8th April 2019 To 22nd April 2019. So, download it with the help of the direct link attached to this page or through the official site online @ newindia.co.in. As theNIACL AO Interview Admit Card 2019 is released, the candidates should note down the NIACL AO Interview Exam Date 2019. The candidates can take their Interview on 8th April 2019 To 22nd April 2019 in their respected center which is mentioned on the newindia.co.in Interview Call Letter 2019. Also, you can get the details of the NIACL AO Selection Process from the below section. The Hopefuls who had applied for the Administrative Officer (Scale-I) post after the Prelims Examination should take the NIACL AO Interview 2019. As the NIACL AO Interview Call Letter is released, all the candidates can download their newindia.co.in AO Interview Admit Card 2019 and prepare well for the Interview. After that, the people who got selected in the Interview will furtherly be assigned for the desired post. Candidates should bring the printout of their NIACL AO Interview Admit Card 2019 to the examination hall. Candidates should download the admit card before the date of exam. The aspirant should bring their Valid ID proof at the time of Exam. A candidate is advised to validate all the details mentioned on their Admit Card. Candidate can carry any one of the given Identity proofs with their latest photographs on the ID proof for verification purpose. Now, the home page of NIACL appears on the screen. Scroll down until you see the Download Call Letter (What’s New) Column. Click on it and then you will find the download link of NIACL AO Interview Hall Ticket 2019. After clicking on it, you need to fill Login Credential at the right side of the page. Enter all the required details and submit the given details. Finally, newindia.co.in AO Interview Call Letter 2019 appears on the screen. Download it and keep it safe for future use. Bookmark our website Freshers Now to get more similar details like NIACL AO Interview Hall Ticket 2019. Also, you can ask us your doubts and questions through the comment section given below.